Massachusetts – U.S. state in the New England region of the northeastern United States of America. 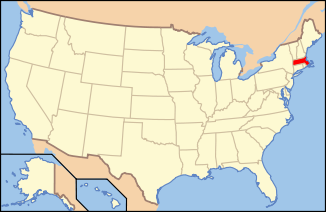 It is bordered by Rhode Island and Connecticut to the south, New York to the west, and Vermont and New Hampshire to the north; at its east lies the Atlantic Ocean. Approximately two-thirds of the state's population lives in Greater Boston, most of which is either urban or suburban. In the late 18th century, Boston became known as the "Cradle of Liberty" for the agitation there that led to the American Revolution and the independence of the United States from Great Britain. Massachusetts is also home to Harvard University, the oldest institution of higher learning in the U.S., founded in 1636. Massachusetts with three major regions highlighted: Central Massachusetts in green and teal (used to show towns in Middlesex County), Eastern Massachusetts in blue and Western Massachusetts in light red. Report: 'Taxachusetts' label remains part of Massachusetts' past, Boston Globe, April 6, 2007. ^ "U.S. Census Bureau State & County QuickFacts Massachusetts".